The Great East Japan Earthquake on March 11, 2011 was an unprecedented large-scale disaster, where not only government offices but also private companies and citizens were involved in various disaster responses. The Tohoku Regional Planning Council did not want to let a number of lessons learned and challenges found from the disaster be forgotten. 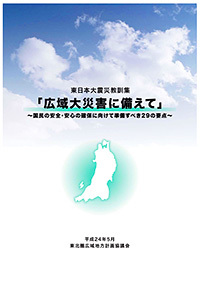 The Council created a collection of lessons to pass them on to the next generation, and make sure that it would be used in preparing a possible large-scale wide-area disaster in the future. The Council hopes that the collection will also be useful in planning various projects in the region, and help improve the region’s disaster prevention strategy for safety of people.